1Department of Pharmacognosy, Technocrates College of Pharmacy, Piplani, Anand nagar, Bhopal, Madhya Pradesh, INDIA. 2Department of Pharmacology, The Pharmaceutical College, Samaleshwari vihar, Barpali, Barghar, Orissa, INDIA. Objective: Tamarindus indica (Family- Fabaceae) show various folkloric uses in treatment of various ailments such as rheumatisum, dysentery, jaundice etc. Aim: The research was conducted to investigate its phytoconstituients and various activity such as antimicrobial, analgesic & anti-inflammatary of AETIRE. Method: The antimicrobial activity was performed on 4 bacterial stains containing (B.subtilis, S.aureus, P. aeruginosa & E.coli) on AETIRE using Disc diffusion method. The Analgesic activity was tested by thermal and chemical induced pain through Hot plate and AAIWT. And carrageenan induced rat paw oedema model is used to evaluate antiinflammatory activity. Result: Phytoconstituients such as tannins, alkaloids, saponins, flavonoids and carbohydrates present in both the extract. The maximum zone of inhibition of about 21mm & 22mm was shown on B.subtilis strain by both the extract when compared with standard drug (Tetracycline & Gentamycin). In AAIWT and hot plate test the AETIRE of concentration (100, 200 mg/kg) produce significant dose-dependent inhibition of pain response with maximum 54.33% protection against acetic acid induced pain and about 74.83% inhibition against thermally induced pain by the aqueous extract 200mg. & the anti- inflammatory activity shown by AETIRE (100 & 200mg/kg) caused significant dose dependent inhibition of oedema with maximum 45.94% inhibition in the Carrageenan induced rat paw oedema by the AE. 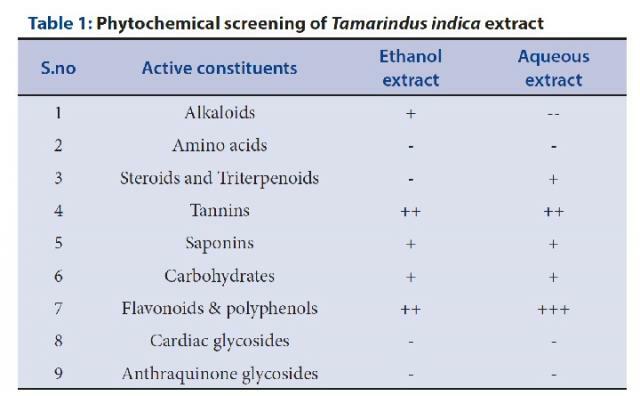 Conclusion: Therefore the AE of Tamarindus indica root was more effective in showing analgesic and anti-inflammatory activity when compared to the standard drug in each model while ethanol extract show effective antimicrobial activity. Gupta S, Singh A. Antimicrobial, Analgesic and Anti - Inflammatory Activity Reported on Tamarindus indica Linn Root Extract. Pharmacognosy Journal. 2017;9(3):410-416.